OK so Jim Henson's Fraggles are indeed making a welcome return... but unfortunately it's not on our T.V's or in our cinemas just yet. Instead they're coming back via Dr. Romanelli's (aka Dr. X) resurrection of the much loved franchise through his new fashion range and music mix involvement. 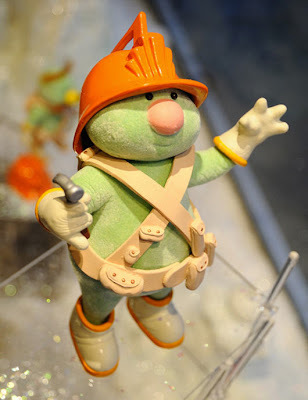 Recently the U.S. Kitson store had an amazing Doozer window display put up which will also move on to Parisian boutique Colette before X-mas. 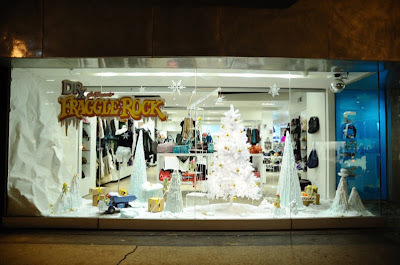 You can see couple of pics of the window display below (Doozers rock!). During the publicity launch a fair number of famous guests were in attendance including the uber-hot Carmen Electra who you can see snogging Red the Fraggle below (gotta love Red's necklace!). It's cool that Jim Henson's various Muppet incarnations keep coming back and that they are honestly considered by many to be real breathing creatures and not just puppets on the end of someones hand. Most of my fondest t.v. memories from when I was a kid are from the Muppet show, Sesame Street and Fraggle Rock as well as the movies Labyrinth and Dark Crystal. And who can forget that the Farscape aliens were Henson Muppet creations too! 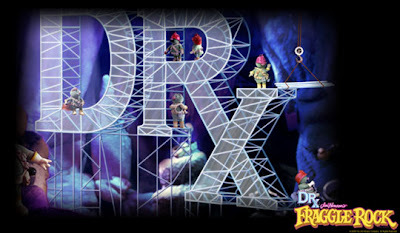 To view the cute little site with all the Fraggle info, and listen to some cool Fraggle theme tune mixes, visit the website HERE.